I begrudgingly wish Anderson and LACMA the best. Begrudgingly because this leaves the AFAM in very tricky straits, and suggests that the beleaguered institution is now at another one of its many star-crossed turning points. For a sense of the checkered history of this special place, go back to December 2001. After years of moves (once occupying an icky anonymous ground floor lobby opposite of Lincoln Center) and confusing name changes, the AFAM opened a spanking new 30,000 square foot building at 45 West 53rd Street, right next door to Museum of Modern Art. The location was amazing, the mood ebullient. It was two months to the day after September 11; the city yearned for a good piece of art news, not to mention a great piece of architecture. These wishes became self-fulfilling. Reviews of the new museum were over the moon. Designed by the firm of Tod Williams Billie Tsien & Associates, the inside and the outside of the building was called astonishing – a shrine, a temple, a Zen masterpiece. Everyone was happy – except lovers of art. By now it’s clear to fans and foes alike that the current building is disaster. (Before he died, Herbert Muschamp, the Times’ architecture critic at the time, sighed to me that I was “probably right” to dislike of the building.) Clad in grayish angled panels, from the outside it looks like a giant upturned Kleenex box. And the interior is worse. Not only is it jammed with differently textured materials, staircases of many scales going in different directions, and nooks and niches that lead nowhere, much of the art is shown in hallways, corridors, landings, and staircases. It is hard to describe how sad it is to see such great art in such confining, confusing, heartless space. Really, AFAM should just sell its building to MoMA. MoMA could then either tear it down and build something new, or transform it into offices. AFAM, meanwhile, could take the proceeds and open a beautiful space in an enormous old renovated industrial building on the far west side of Manhattan. None of that will happen, of course. (AFAM would have to admit a terrible mistake, and remain in psychic limbo for an interim period. 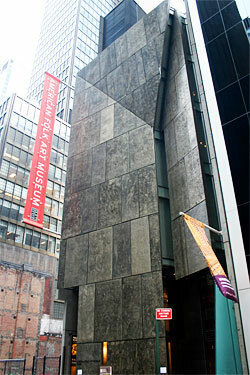 And it would be dicey, to say the least, for MoMA to tear down a once-praised building.) Which brings us back to Anderson’s departure. AFAM now must do two things: Find not just an able academic or good bureaucrat to replace Brooke Davis Anderson, but a curator with vision and passion, someone able to light a fire under the museum. Then it has to salvage that enervating interior – there are many people who could carry out a renovation on a building like this one. Both of these things are possible. Both are difficult. AFAM simply has to be as fearless, audacious, and as out-there as the art it is so committed to showing.